Cuba is a country with a palpable rhythm. Music and dance are the heart and soul of the island. It’s an energetic mix of soulful Spanish melodies and lyrical traditions, and dynamic African percussion and beats. On our upcoming voyages calling on Havana, Cuba, Azamara guests will experience the magic and passion of Cuban music and dance in person. Cuba’s contribution to the world music scene is as varied as it is significant. Afro-Cuban Jazz (also known as Cubop), Mambo, and Salsa are most notable. To understand Cuba, you must understand Cuban music and dance. Here’s our guide this important aspect of the island’s culture. 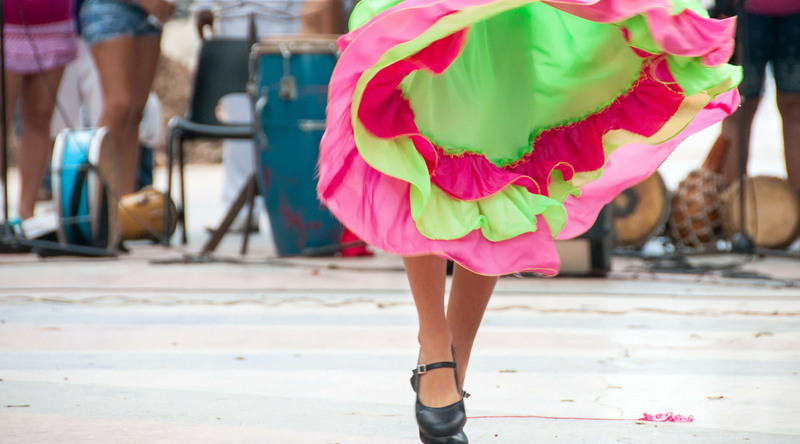 Danzón is the official music and dance of Cuba and dates back to the late 1800s. Danzón isn’t just an important root of music and dance in Cuban culture – it’s an important basis for world music in general. Partners perform the slow, formal dance of danzón to music written in 2/4 time. Considered an elegant, traditional dance today, danzón was once considered too intimate and scandalous for high society. Trova is an important part of the foundation of Cuban music and dates back to the 19th century when roaming musicians called trovadores earned their living by singing and playing guitar. Perhaps the most famous type of trova music is Cuban bolero. Like its predecessor Spanish bolero, Cuban bolero music and dance is romantic and tender. However, the Cuban style is more rhythmic, and singing is more prevalent. After the Cuban Revolution, Nuevo Trova emerged. In this new style of music, which remained popular throughout the 1970s, lyrics had a political message. Rumba represents Cuba’s African influences, and is one of Cuba’s most celebrated forms of music and dance. The genre is energetic and soulful, using conga drums, claves, maracas, scrapers and bells. When you listen to rumba, you can’t help but start to dance! Over time, Cuban rumba was influenced by the Son Cubano style of music and new instruments like the trumpet, piano and double-bass were introduced. Cuban rumba is not the same as American ballroom rumba (or rhumba), but inspired the popular ballroom dance category. Afro-Cuban Jazz and American Jazz have always had strong ties. Early on, close connections between New Orleans jazz musicians and Cuban musicians led to a fascinating cross-pollination of genres and influences. True Afro-Cuban Jazz didn’t emerge until New York in the 1940s, thanks largely to a band called “Machito and his Afro-Cubans”. Over time the genre was blended with bebop jazz, resulting in a fast-paced and quirky style known as “Cubop”. For decades Afro-Cuban Jazz and Cubop remained more popular in the United States than in Cuba itself. It wasn’t until the 1970s that jazz returned to the Cuban music scene. The word mambo means “conversation with the gods” in Kikongo, the language of Central African slaves who were brought to Cuba. Mambo as a music and dance genre developed in Cuba in the late 1930s, combining danzón with traditional African rhythms. In the 1950s, mambo arrived in New York – and it was everywhere. Dance lessons were advertised in the newspaper, music labels put out mambo records, and New York’s famous Broadway dance hall, the Palladium Ballroom, became a mecca for renowned performers. By 1954, mambo mania had even spread to Europe, while a new kind of mambo dance – the cha-cha-chá was sweeping through Havana. Salsa dancing originated in New York in the 1970s, and incorporated elements of mambo, cha-cha-chá, swing and hustle, as well as Afro-Caribbean and Afro-Cuban dance styles. But even though salsa dancing technically comes from New York, no one as is famous for it as the Cuban people. Timba and is derived from the same roots as salsa, and describes modern, popular dance music in Cuba. Timba is more heavily influenced by Afro-Cuban musical genres, while Salsa’s influences are Son Cubano and Conjunto. Timba is particularly associated with Havana, so you’re bound to hear from while you’re there! Are you ready to experience some incredible Cuban music and dance firsthand? Azamara can help. Click here to explore our Cuban itineraries. In the meantime, check out this Spotify playlist of great Cuban music!